Sorry, no screenings in your area. With 20th Century Women, acclaimed filmmaker Mike Mills (the Academy Award®- winning Beginners) brings us a richly multilayered, funny, heart-stirring celebration of the complexities of women, family, time, and the connections we search for our whole lives. Set in Santa Barbara, the film follows Dorothea Fields (Annette Bening), a determined single mother in her mid-50s who is raising her adolescent son, Jamie (newcomer Lucas Jade Zumann, in a breakout performance) at a moment brimming with cultural change and rebellion. Dorothea enlists the help of two younger women in Jamie’s upbringing — via Abbie (Greta Gerwig), a free-spirited punk artist living as a boarder in the Fields’ home, and Julie (Elle Fanning), a savvy and provocative teenage neighbor. 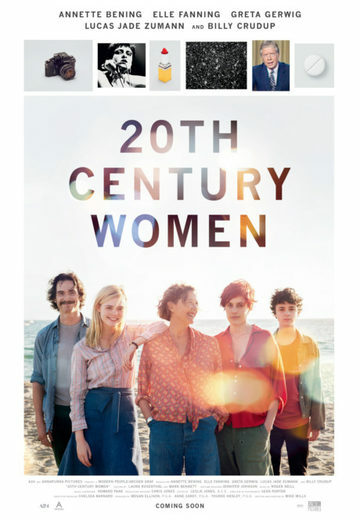 20th Century Women is a poignant love letter to the people who raise us – and the times that form us – as this makeshift family forges fragile connections that will mystify and inspire them through their lives.